The Last Jedi is released later this week - 40 years after Star Wars fever first came to Britain. But the original film would never have been made without a British studio and host of talented artists and technicians. Long before it became an all-conquering cultural phenomenon, Star Wars was facing a problem. Director George Lucas had cast a trio of young unknown American actors in the lead roles of his space adventure and was gearing up to shoot in Britain. But his UK production executive Peter Beale knew Britain probably wouldn't let them. "Equity was trying to look after the British actors; there was no work around and they didn't want foreign actors coming in and taking midsize roles or big roles that the British actors could do," he said. But Harrison Ford, Carrie Fisher and Mark Hamill needed work permits. So Beale, like others involved in the blockbuster's production, had to get creative. He drew up an alternative cast list showing the film's British actors, including Alec Guinness, Peter Cushing and David Prowse at the top, and Ford, Fisher and Hamill in apparently minor roles. "I went to Equity and said 'Look, the English have got the best parts in this, but the director wants three little Americans for the smaller parts' and I also went to the Home Office and told them the truth... and they supported it because they wanted the work and they recognised it." What did Equity say? "By the time they realised, I think they had forgiven me." As one of the world's best-loved and most successful films, the casual observer might think of Star Wars as the archetypal Hollywood blockbuster, created in the studios of Los Angeles. But as fans of the saga and film history know, the movie that spawned a multibillion-dollar franchise was shot mainly in Hertfordshire at Elstree Studios, Borehamwood - using the talent, expertise and ingenuity of hundreds of British workers. A new documentary, The Galaxy Britain Built, tracked down these filmmakers to get their stories, revealing how they drew on all their ingenuity to bring George Lucas's vision to life in the face of a tight schedule and even tighter budget. Costume designer John Mollo won an Oscar for his work on Star Wars and kept all of his original workbooks with early sketches of characters including Chewbacca and the Jedi. During pre-production, he would meet Lucas every morning and remained modest about his award-winning creations. "It was a question of who won and who didn't that particular day. We [him and Lucas] always got on pretty well," he said. "The costumes were pretty simple on the whole. They were very straightforward, in fact." The interview was Mollo's last. He died in October, aged 86. Despite its modest budget, Star Wars remained a big production. At least seven sound stages would be needed, and only two or three were available at 20th Century Fox's Los Angeles studios. Cost was another major factor. Executives originally estimated the film could be made in the UK for $4m, half the cost of Hollywood. Production supervisor Robert Watts told how he was rebuffed when he asked to rent every available stage at Pinewood Studios in Buckinghamshire. Elstree, however, quoted £75,000 for the entire studio. "All the stages, all the workshops - everything," said Watts. "Fantastic. Best deal I've ever made in my life." Money was tight throughout the production, which caused a huge headache for set decorator Roger Christian. "I had a list of weapons, robots, sets, vehicles," he said. "[I] just stared at it in horror, thinking 'I can't do this.'" Improvisation was needed. R2-D2's dome was made from a lampshade salvaged from a scrapheap. Another breakthrough was the design of the lightsaber, which Christian knew would be the "Excalibur" of the film. "I just took it and went 'There it is. This is the Holy Grail,'" he said. Star Wars may now be established as the one of the most successful franchises in movie history, but Lucas's ideas were initially met with scepticism. Science fiction simply wasn't "box office", and few believed a space movie would be a hit. "Space and special effects were considered B movies, and this was a comic-book, expensive B movie, a lot of people thought," said Peter Beale, the executive in charge of production who was forced into the work permit improvisation. Art director Les Dilley went further. He said that scepticism extended to the British crew. "No, I don't think we really understood it," he said. "I remember a couple of people on the crew said 'Well what is it? A load of rubbish. What does all this mean?'" Image caption When Peter Beale told his boss it was impossible to fit four weeks' work into a fortnight, he was told: "Solve it." Another challenge came in the form of the trade unions. 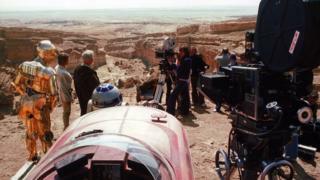 The film's American producer Gary Kurtz told how production returned to Elstree after a challenging shoot in Tunisia. "We were warned in advance that British crews were very sticky about the time of day they worked and whether the shop stewards would allow you to work overtime at the end of the day or not. On location, they were fantastic. In the studio, it was more difficult," he said. But many problems could be ironed out through another British tradition: going for a pint. "We did discuss potential problems for the next day's shoot and sometimes solve them, there in the pub," he added. Documentary-maker David Whiteley grew up with Star Wars, and has fond memories of watching the films with his dad, Clive, who died 11 years ago. "Star Wars was mine and my dad's thing, so there's an element of nostalgia, it was a time everything felt good," he said. "I wish he was around to see I've made a documentary about it." Born on 4 May - "Star Wars Day" - three weeks before the original movie's US release, Whiteley's interest was rekindled by 2015's release of The Force Awakens and the idea for The Galaxy Britain Built came soon after. Eighteen months' work followed to track down the veteran filmmakers. Countless emails, letters and phone calls were needed. Highlights included handling Roger Christian's prototype lightsaber - "That was pretty amazing" - and leafing through John Mollo's sketchbooks: "Apparently I said 'I'm trying to remain professional but on the inside I'm like a child again.'" Whiteley said it had been an honour to meet his filmmaking heroes and hear their stories. "You don't really hear from these guys. They haven't done many interviews," he said. "They are very proud but also very humble, and that comes across in the film. They were just doing their job but at the time they realised they were working on something very special and it was a very exciting time. "They all say it was a privilege to do it and that Star Wars made their careers." Away from the pub, a much bigger logistical problem appeared on the horizon when shooting overran and the film's financiers ordered it to cease in two weeks - with four weeks' work still to do. And despite the headaches and doubts about the material, one moment stood out that made him realise the movie could be a hit. "I got to the set late one day and noticed there were some children on the set and I thought 'What's happening here?'" The children were fascinated by the droids R2-D2 and C-3PO, but slightly scared of Chewbacca. More youngsters visited and had the same reaction. "I started to think 'Well, if the children are relating at this level, maybe we have something.'" That was confirmed at the film's premiere on 25 May 1977. "It was absolutely thrilling. To have seen all that come together, and come together so well... it was fantastic," said Beale. Christian said: "I felt the entire cinema almost left their seats... everyone just exploded, and you knew then this was going to be a massive hit and everyone came out buzzing." Makers of subsequent Star Wars movies, including Gareth Edwards, director of 2016's Rogue One, have returned to film at Elstree. He described it as "such a great experience". Edwards, from Nuneaton in Warwickshire, said: "I think as a kid you picture it in this galaxy far, far away and it's a real shock to learn one day that it was just somewhere off the M25. "It'd be very easy to argue that you'd worked with the best in the world." Colin Goudie, who edited Rogue One, said: "These are the movies that the whole world is going to watch. And it's made in Britain." Watts, whose own production credits include two Indiana Jones movies, believes Elstree was a "lucky charm" for Star Wars, but added: "Talent... that's the most important thing. "Here in Britain we have the most extraordinary talent, both in the acting profession and but also, very importantly, in the production department of it. "To this very day, I still have to pinch myself because people say to me sometimes 'You worked on Star Wars'. I'm extremely proud to have been involved in it. "I look at myself now as I get older and the rest of it, and I think 'Bloody hell Robert, how did that happen?' It was something else." The Galaxy Britain Built will be shown on BBC Four on 21 December at 22:00 GMT and then on BBC iPlayer.